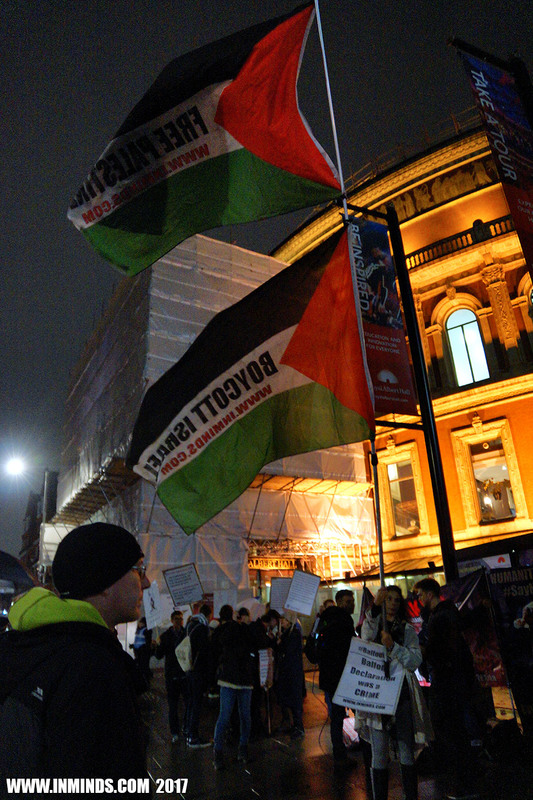 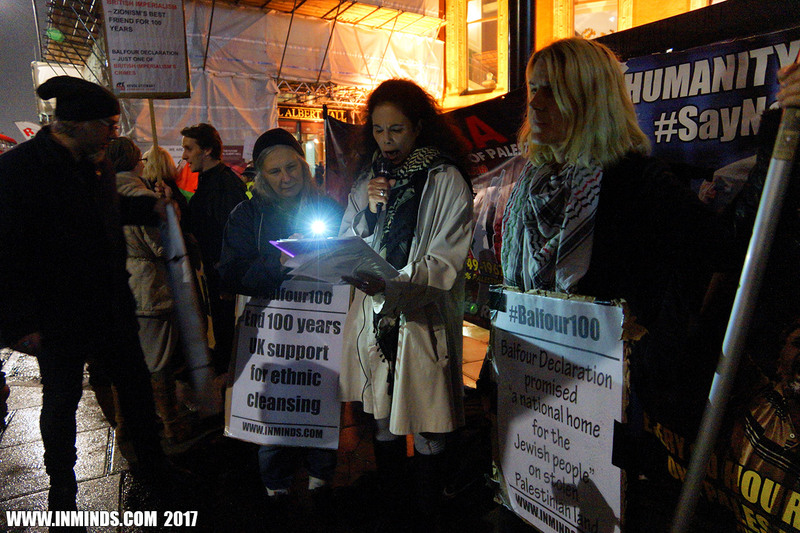 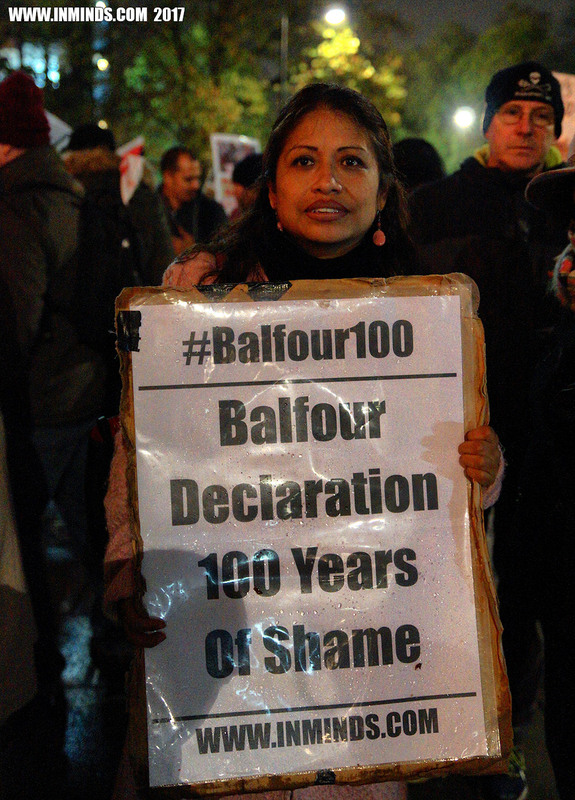 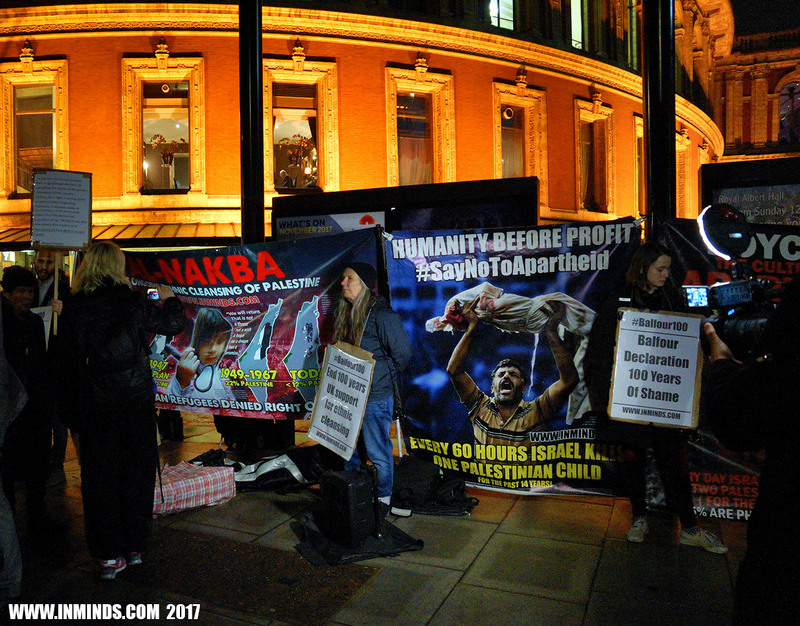 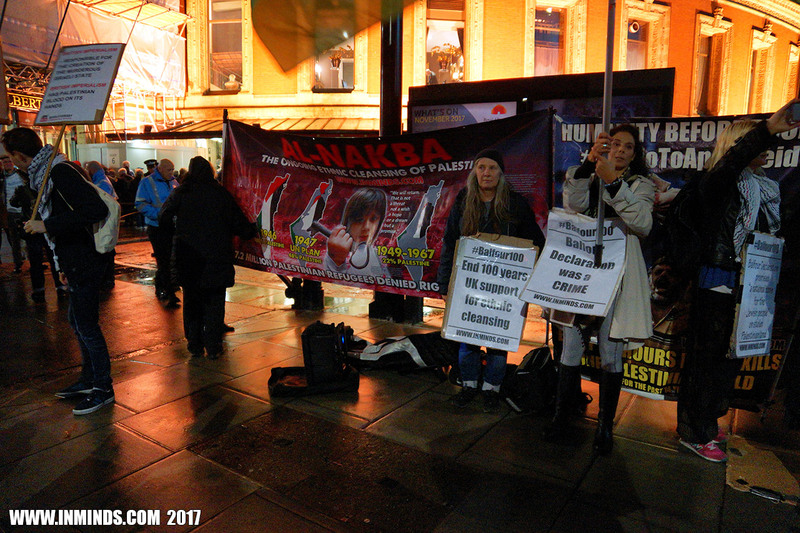 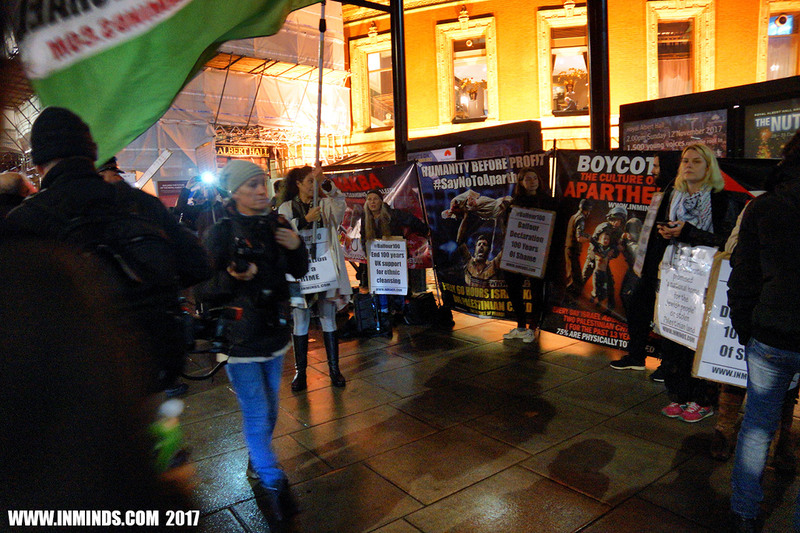 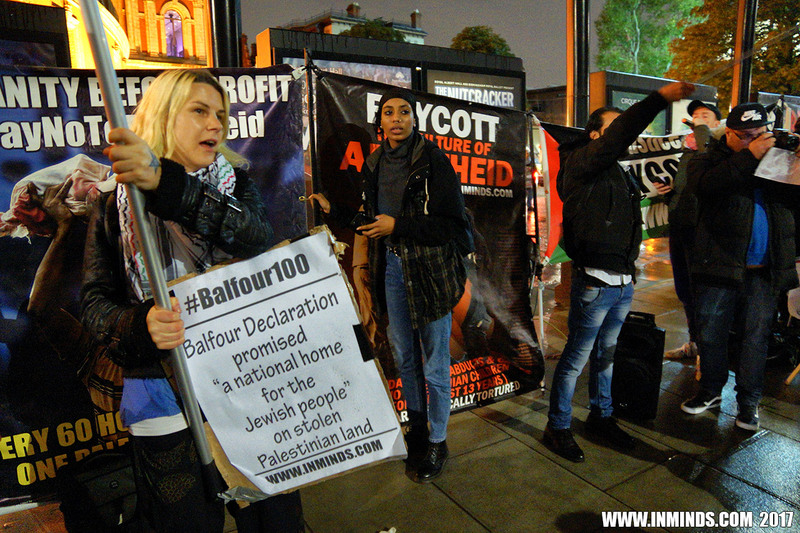 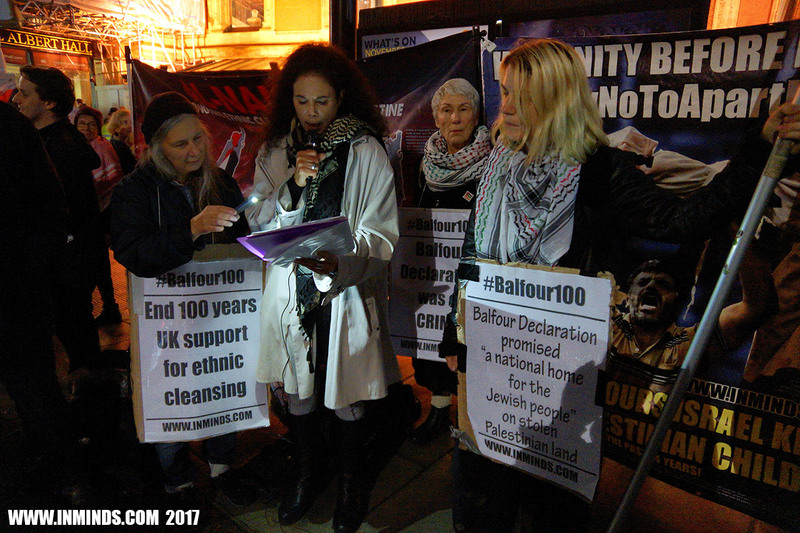 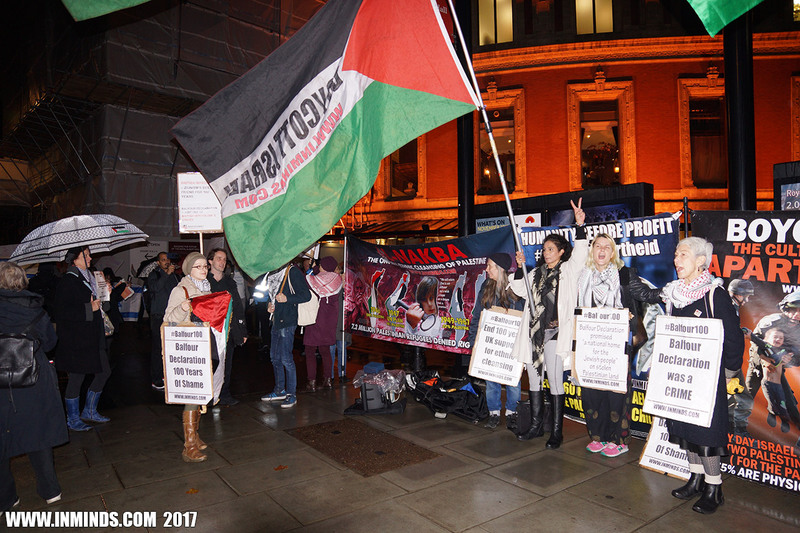 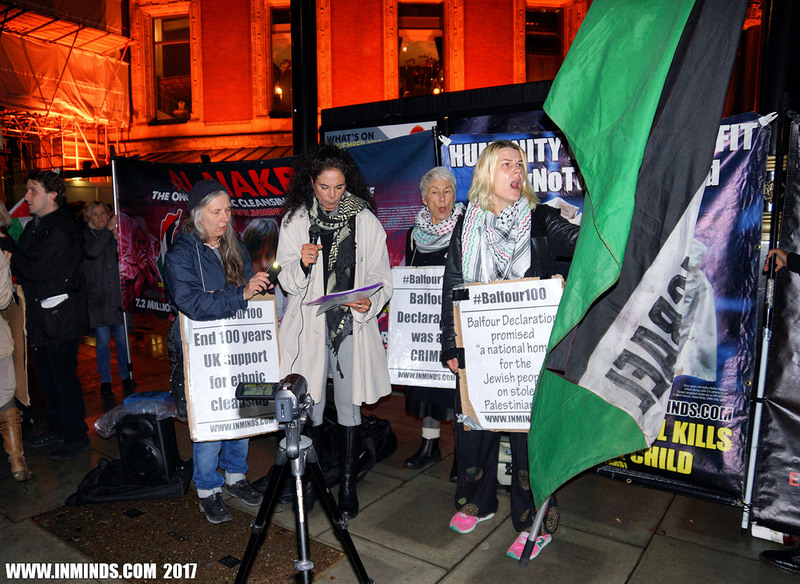 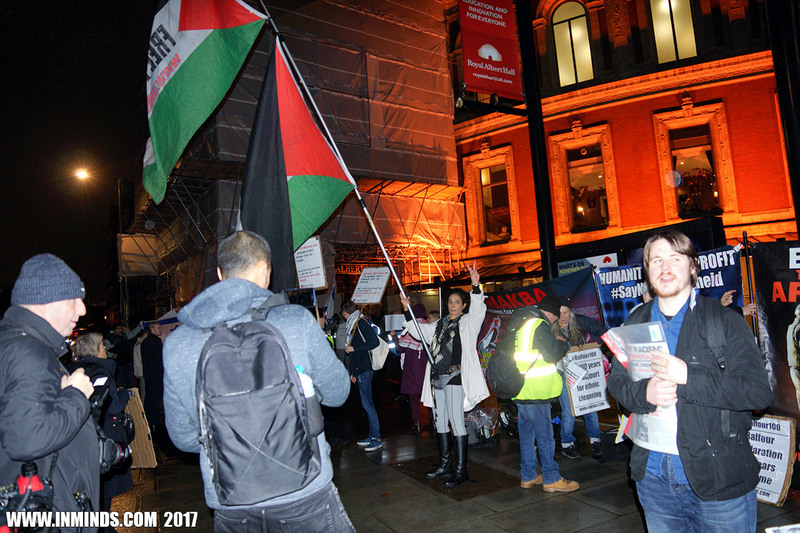 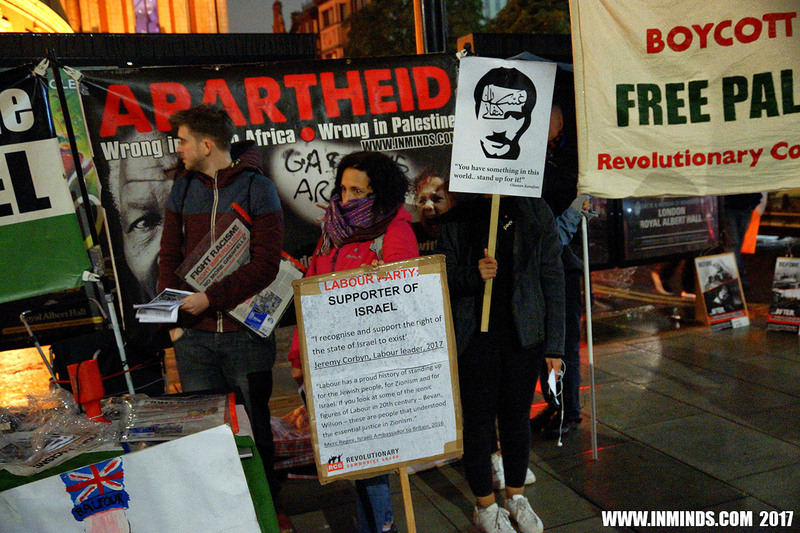 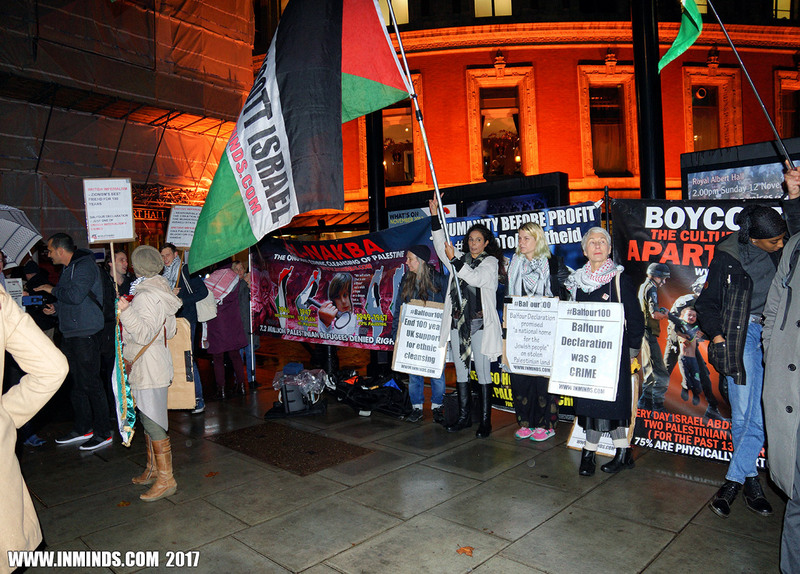 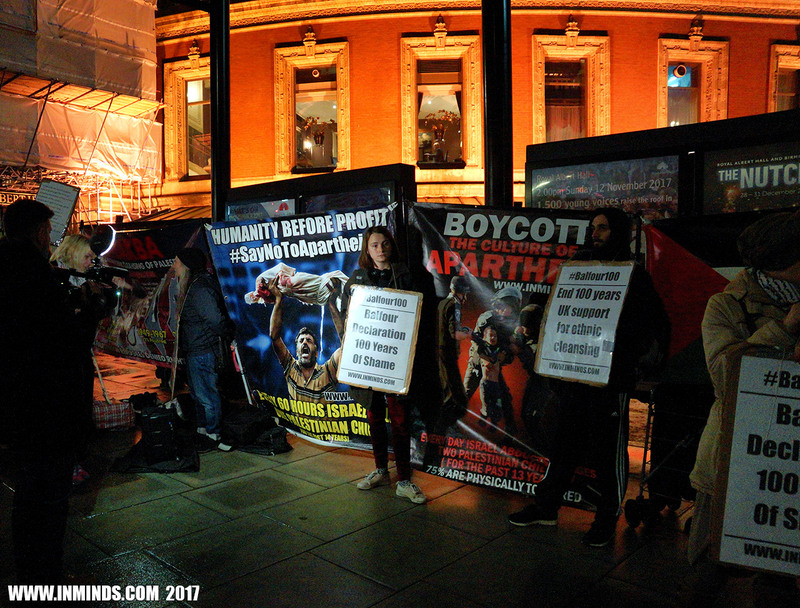 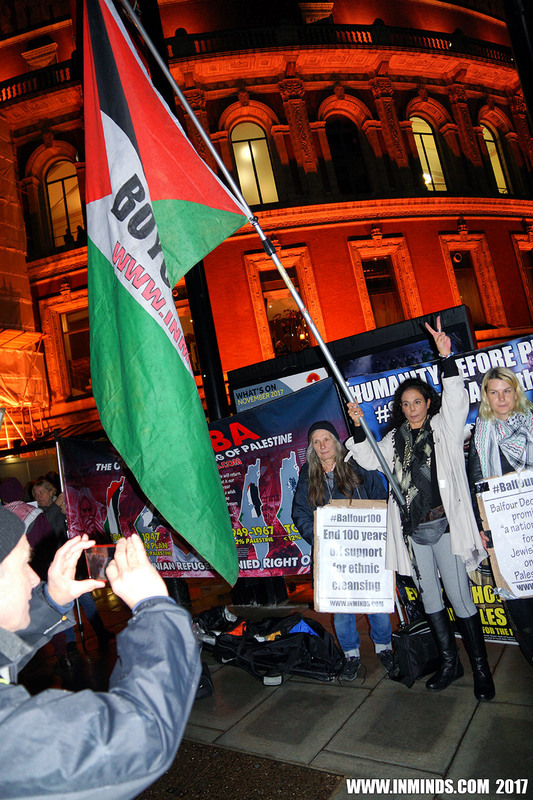 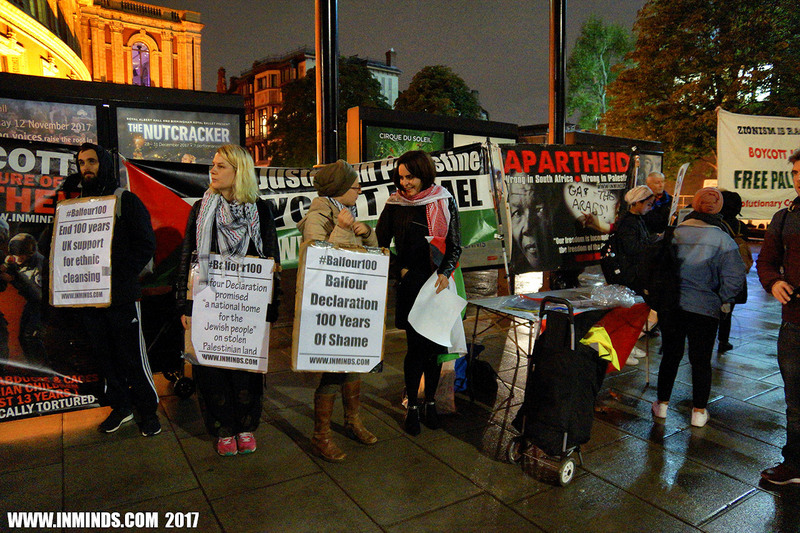 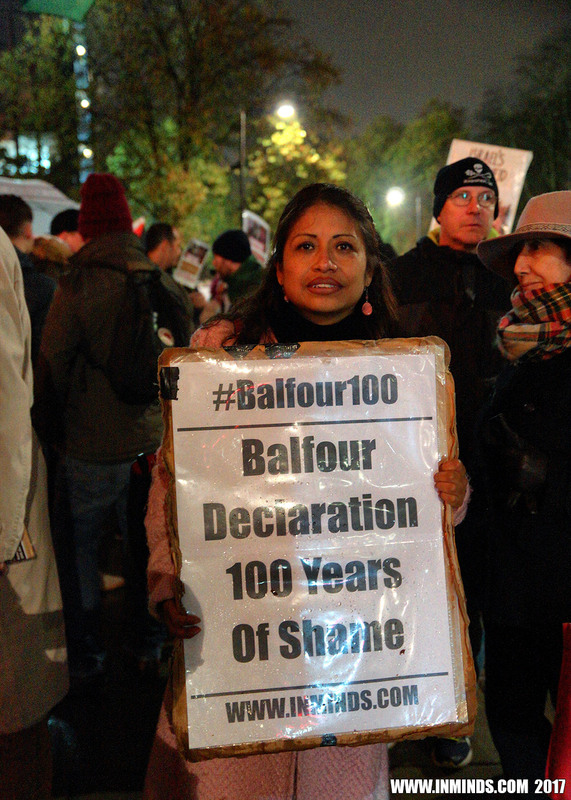 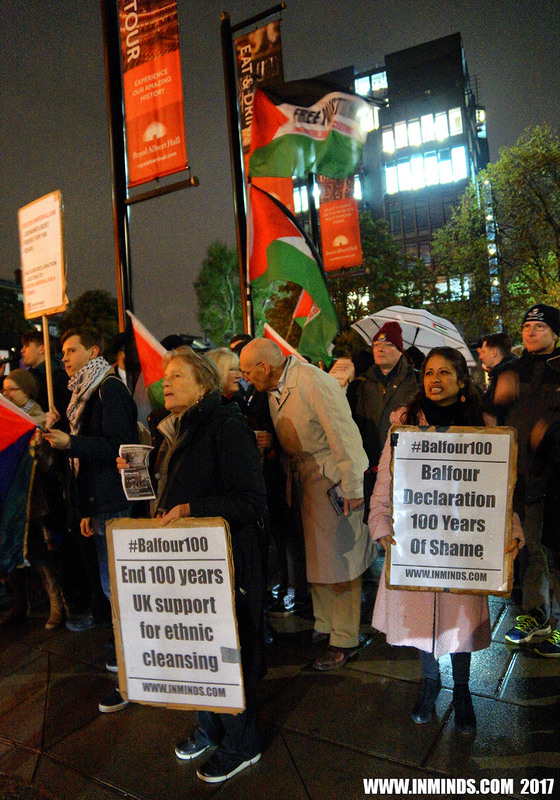 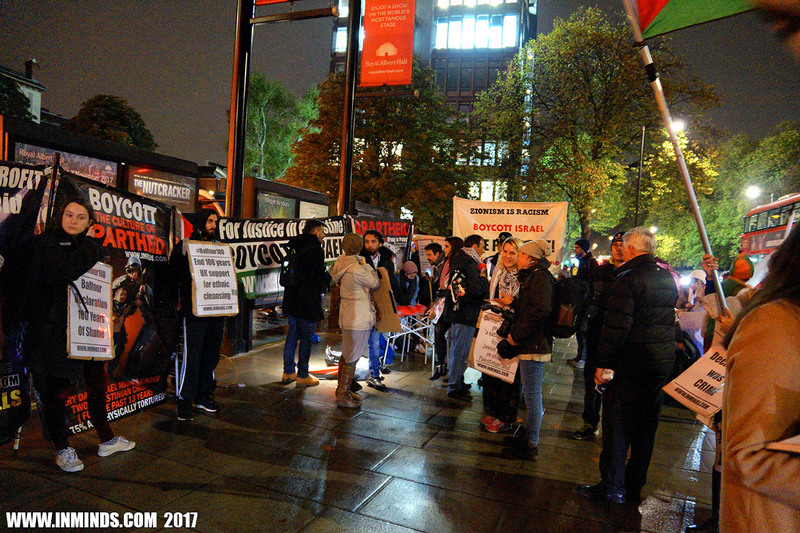 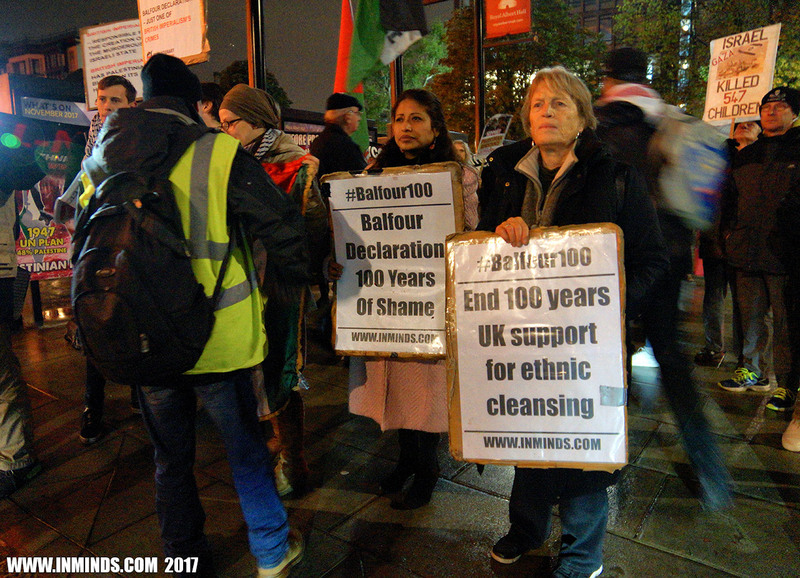 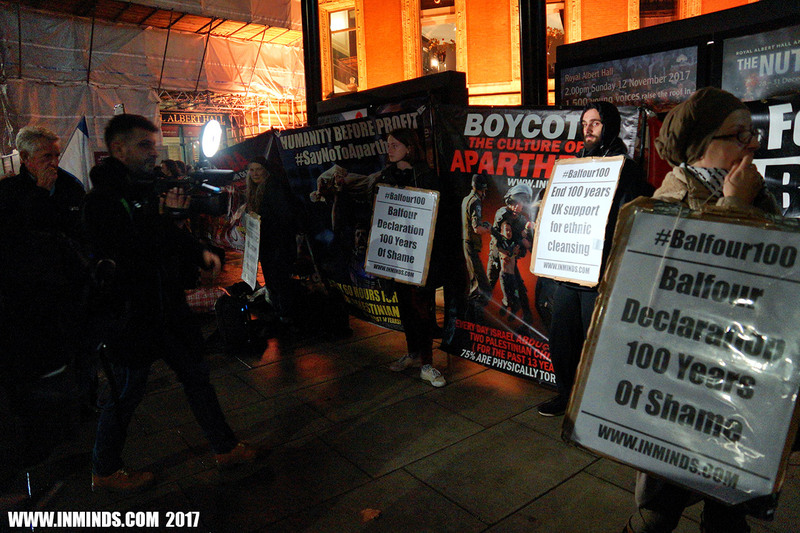 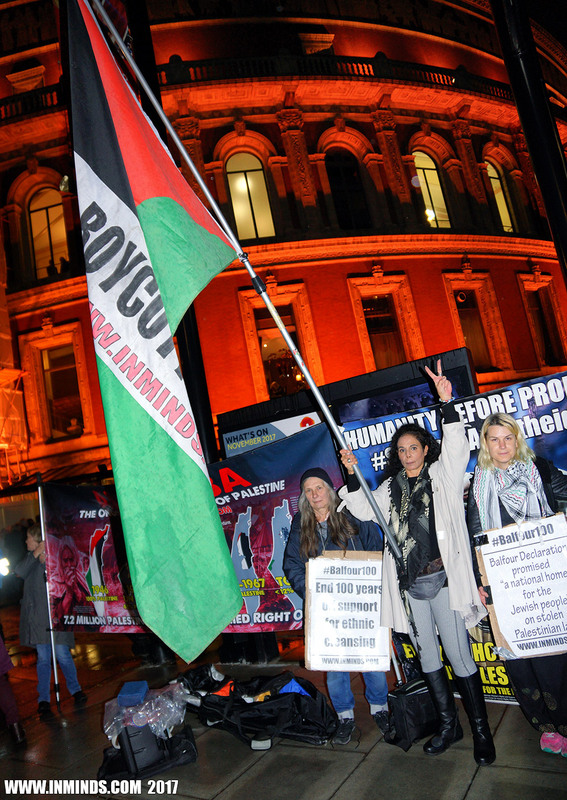 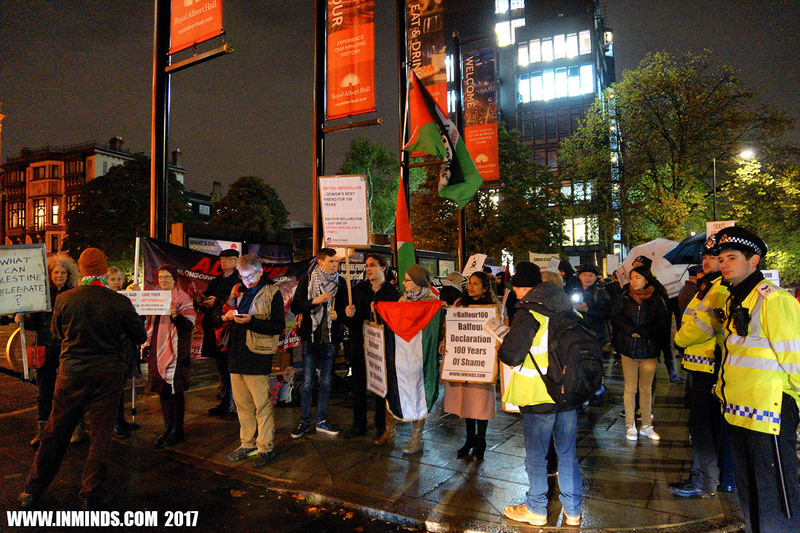 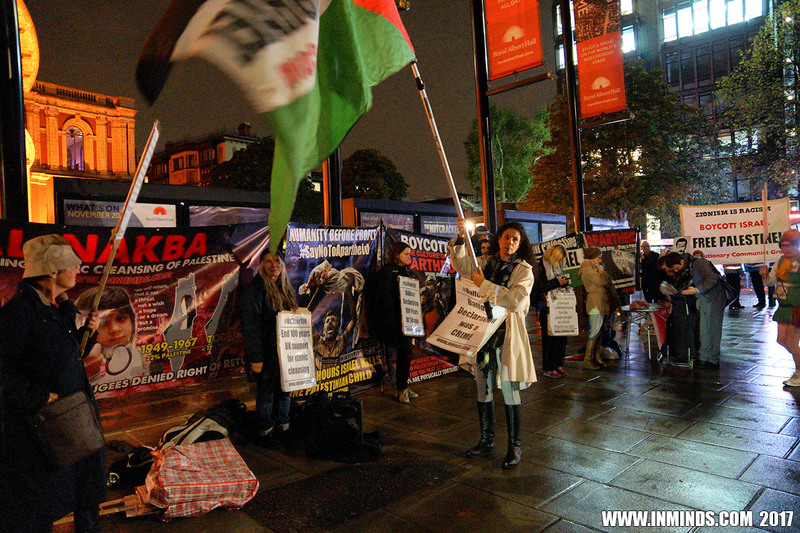 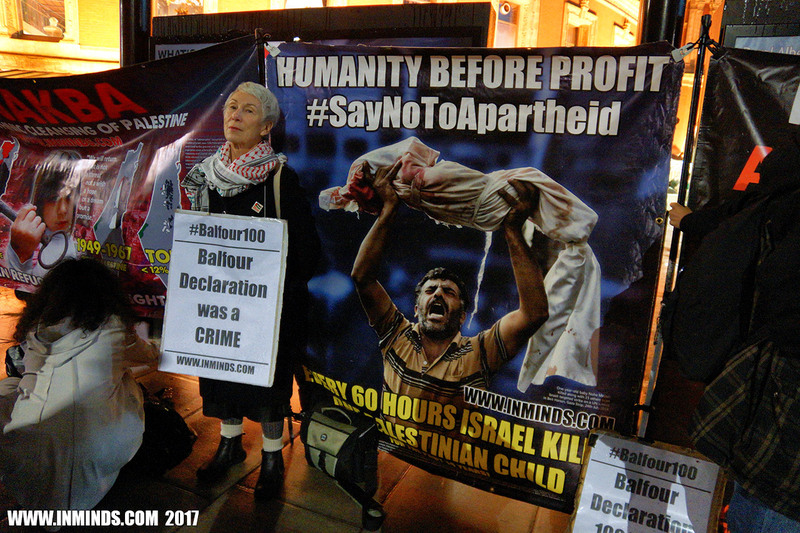 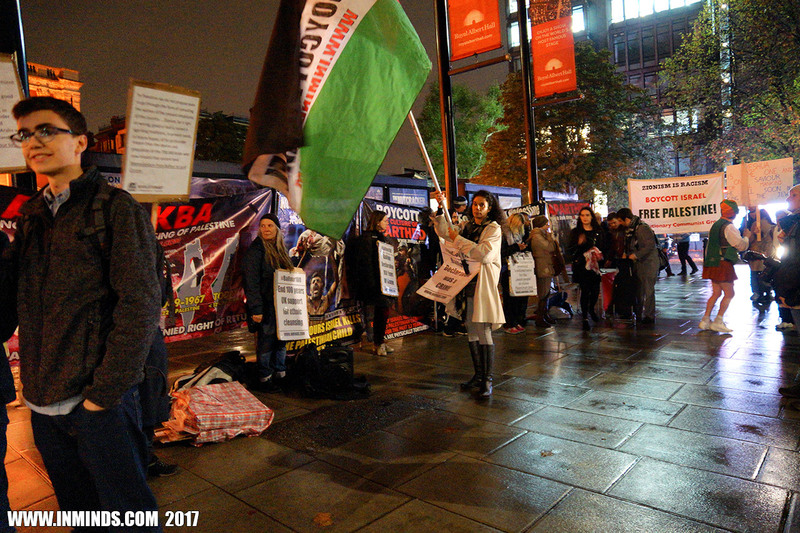 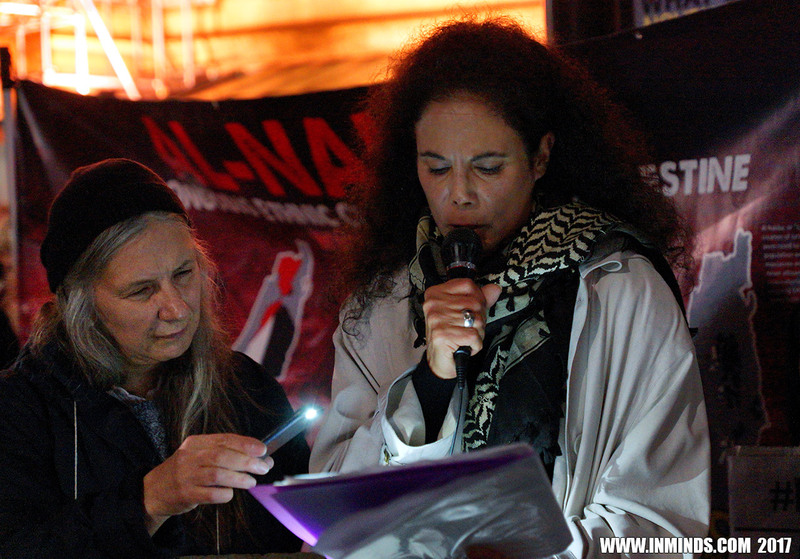 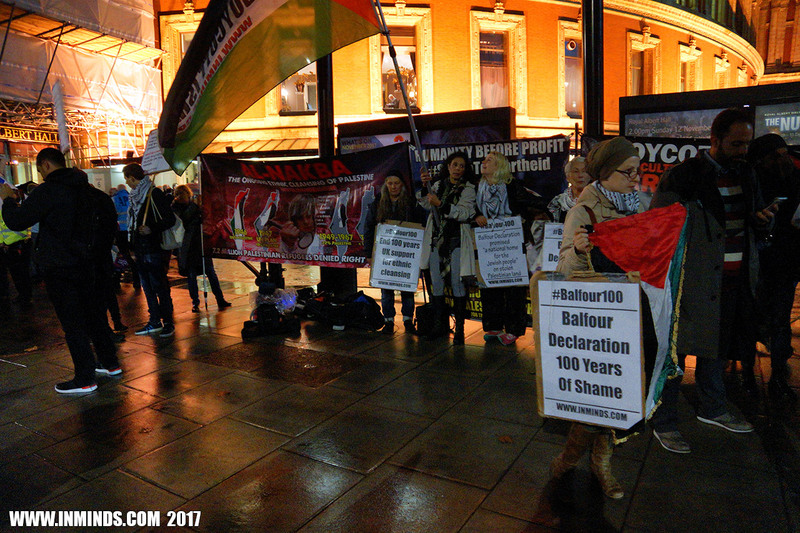 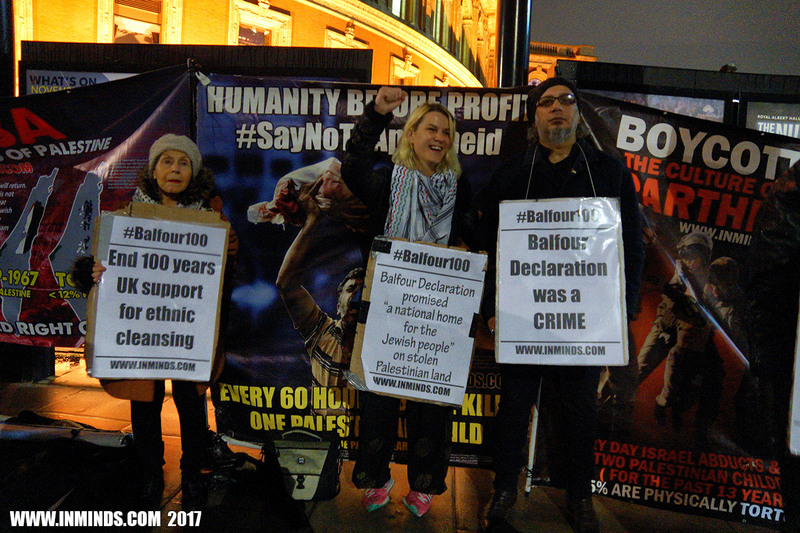 On Tuesday 7th November 2017 Inminds human right group along with Victory to the Intifada, RCG - Revolutionary Communist Group, Youth Against Balfour and Samidoun, protested outside the Royal Albert Hall, where 5000 zionists were celebrating the centenary anniversary of the Balfour declaration. 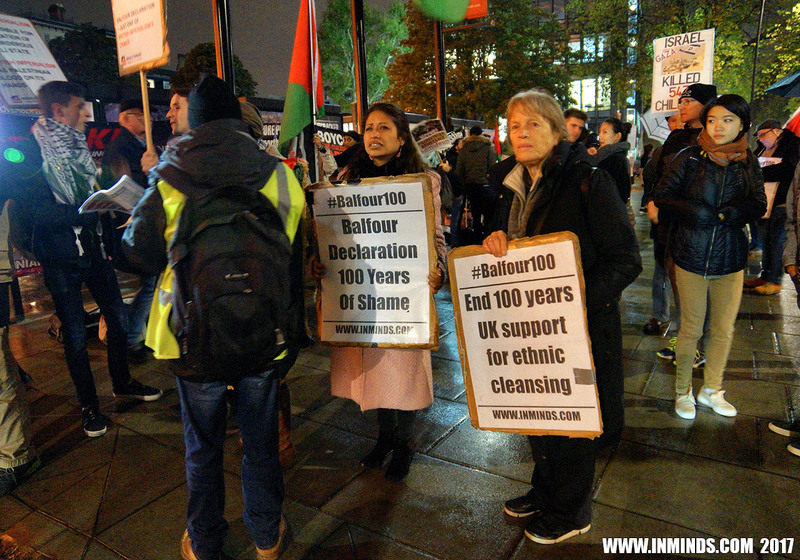 Inminds chair Abbas Ali said "For Britain its a day of shame, a hundred years of shame. 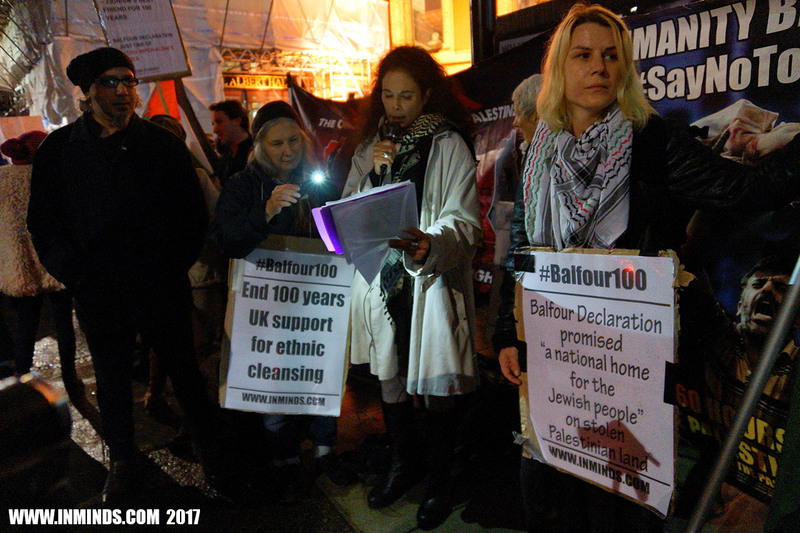 Balfour's letter to the head of the Rothschild banking dynasty promising to give stolen land to the Zionist federation for their settler colony was a crime which wiped Palestine from the map and unleashed a 100 years of suffering on the Palestinian people. 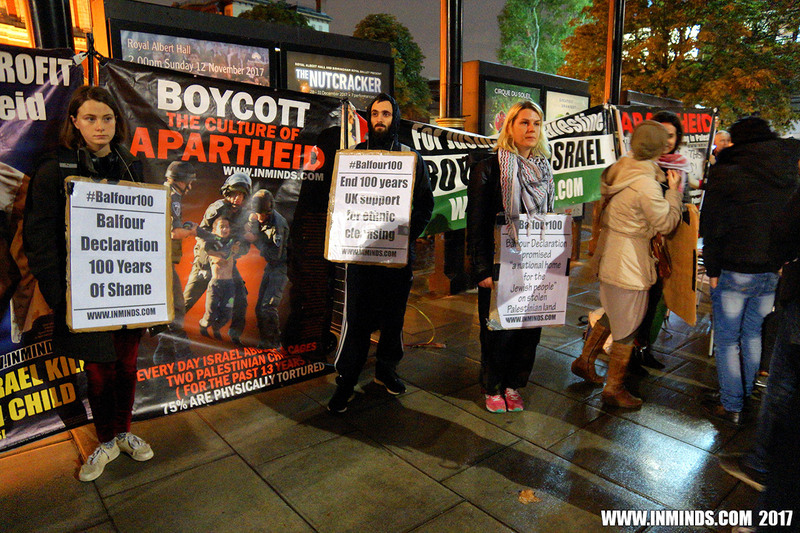 "Its grotesque that anyone would want to celebrate this human suffering. 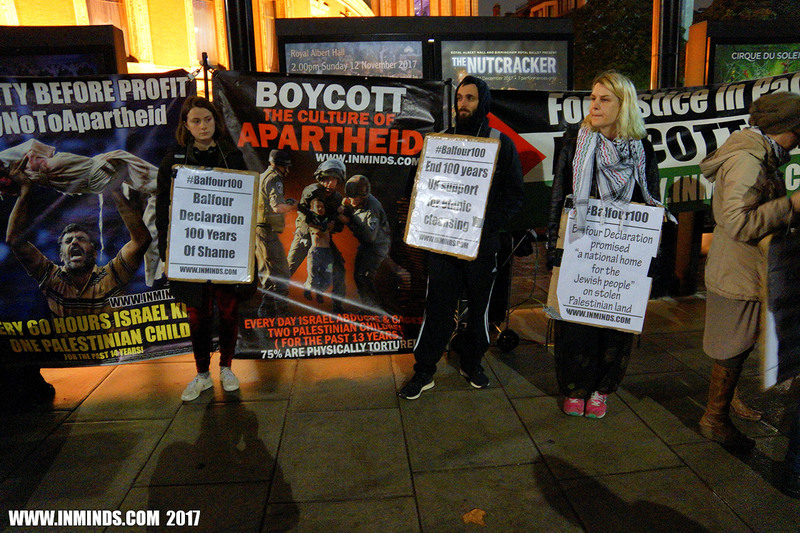 Shamefully, the Albert Hall has pandered to these racists and refused to cancel this celebration, calling it a "cultural event". 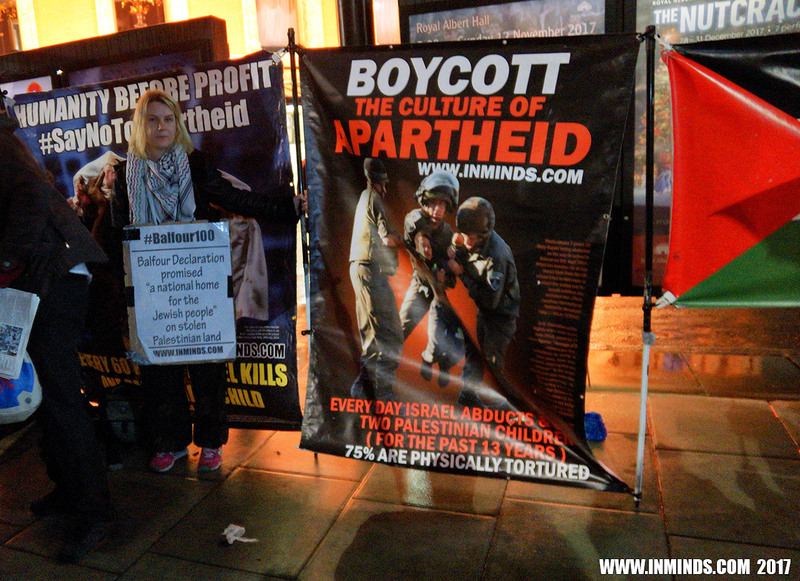 We are here to say you cannot whitewash a hundred years of ethnic cleansing, apartheid and genocide by culture. 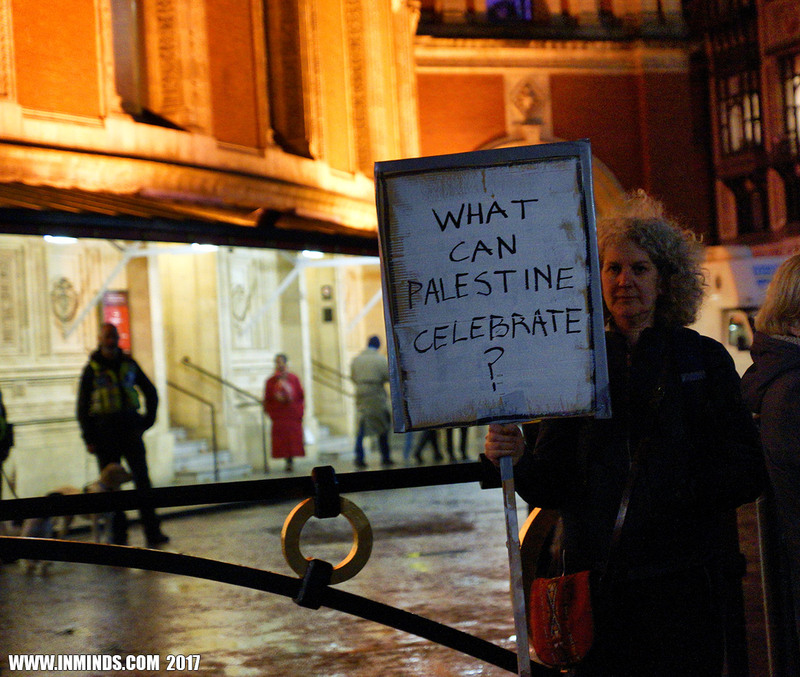 Would the Albert Hall allow a cultural celebration of the Third Reich on the anniversary of Hitlers Birthday? 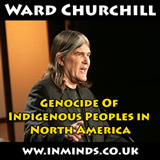 Of course not, nor should they have allowed this despicable event to go ahead." 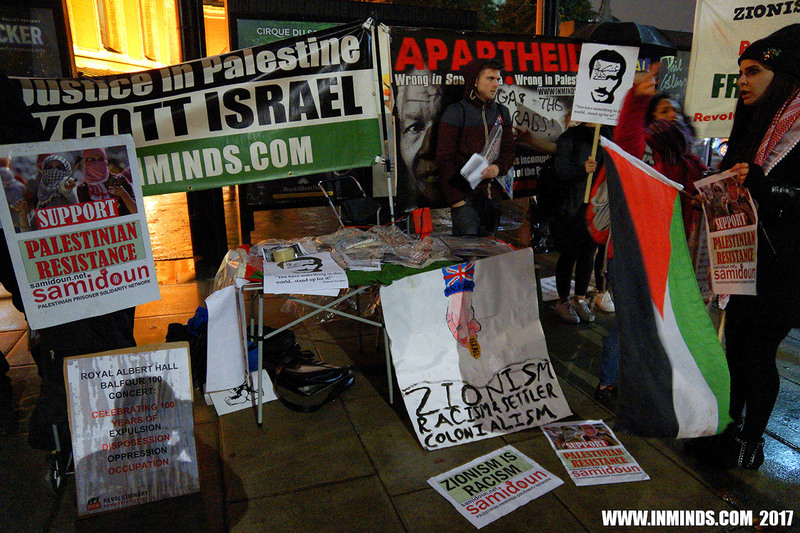 Inminds chair Abbas Ali added "We are also here to tell those celebrating inside that they have failed! 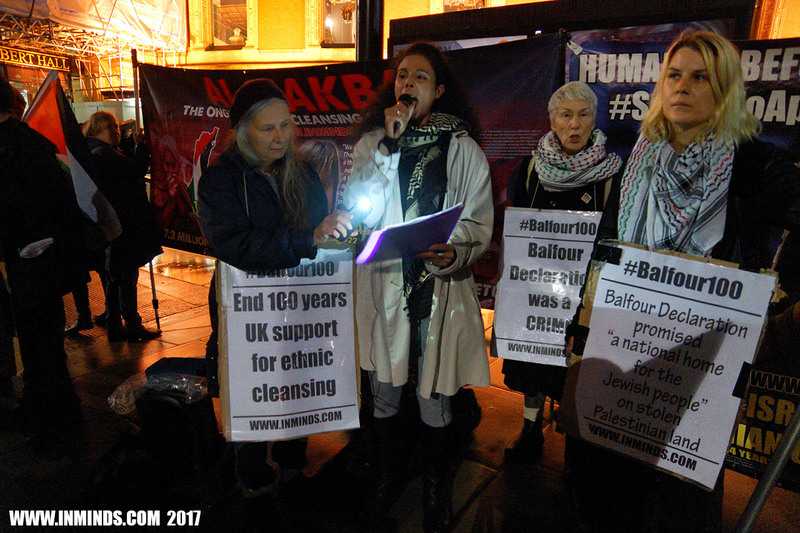 Balfour's 67 worded declaration might have wiped Palestine off the map, but the Palestinian people remain undefeated and Palestine will rise again!" 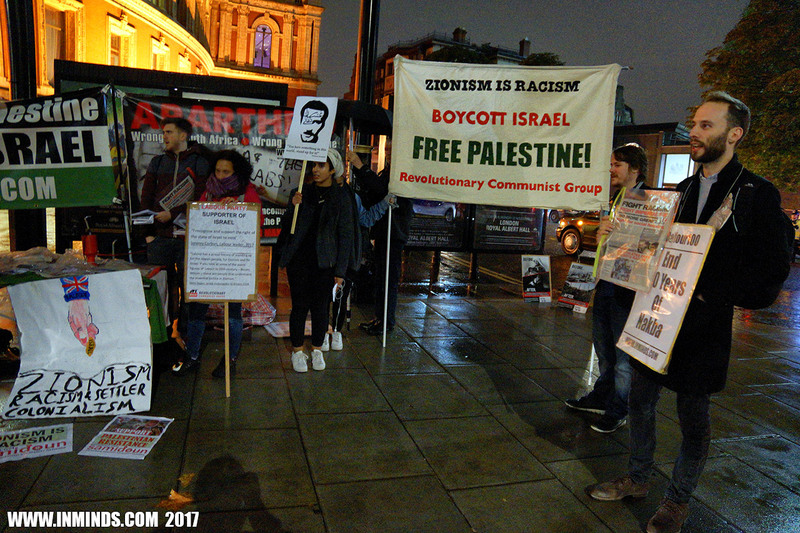 The event was hosted by messianic fundamentalist Christian Zionists who believe that the gathering of the Jews in Israel, and later their conversion to Christianity, is a prerequisite for the Second Coming of Jesus. 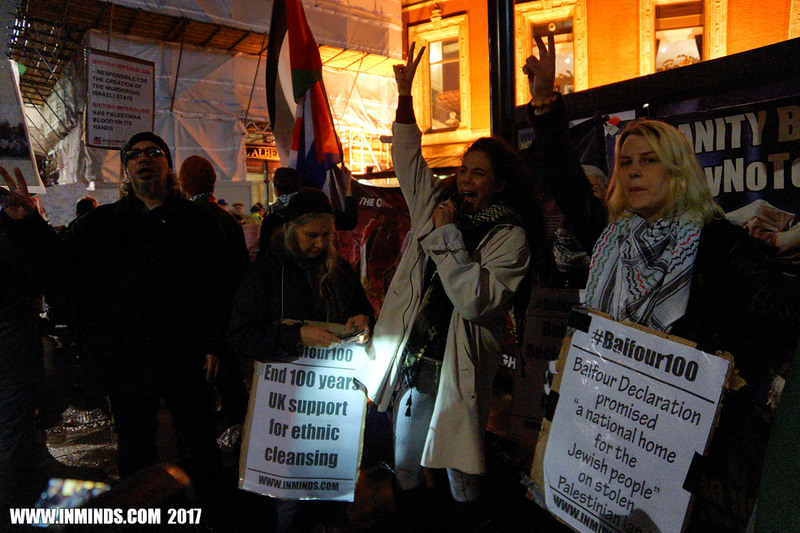 Christian Zionism whose ultimate aim, in order to fulfil prophecy, is to eradicate Judaism, has always worked hand in hand with Jewish Zionism, an essentially secular movement. 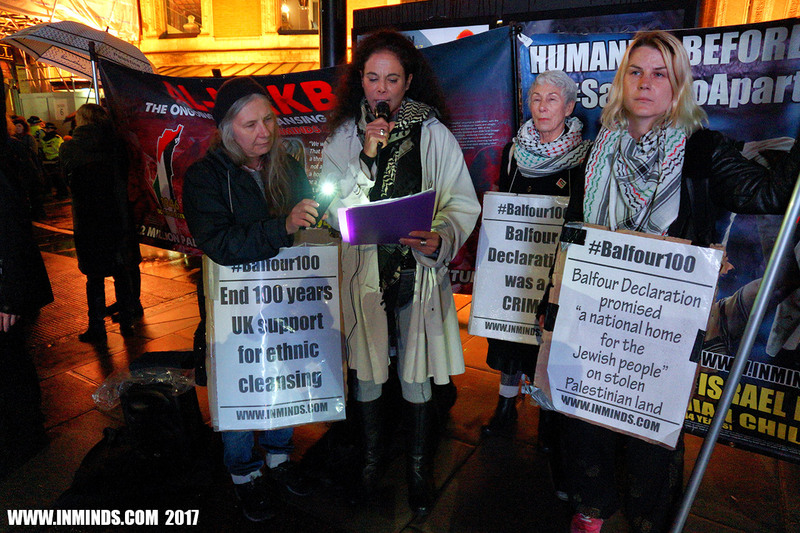 When Britain officially took control of Palestine, the Zionist Federation under the chairmanship of Lord Rothschild celebrated the event at the Albert Hall on July 12, 1920, with guest of honour Lord Balfour. 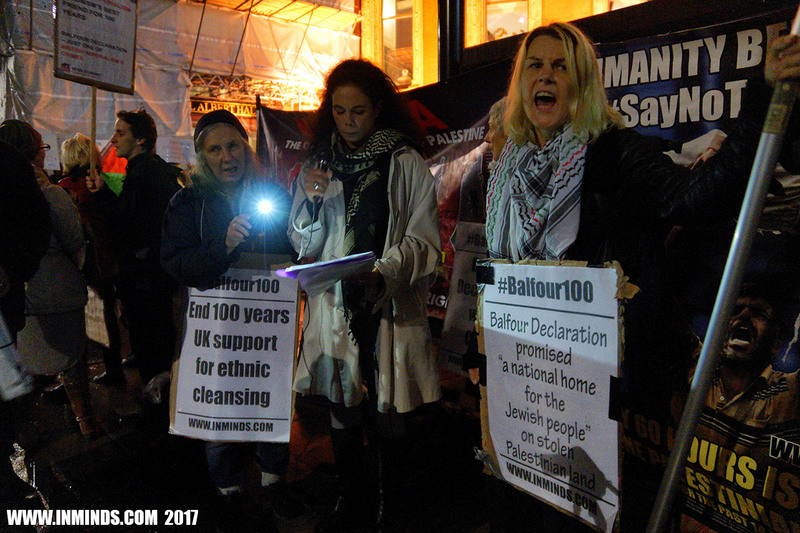 At the celebration Lord Balfour declared "For long I have been a convinced Zionist". 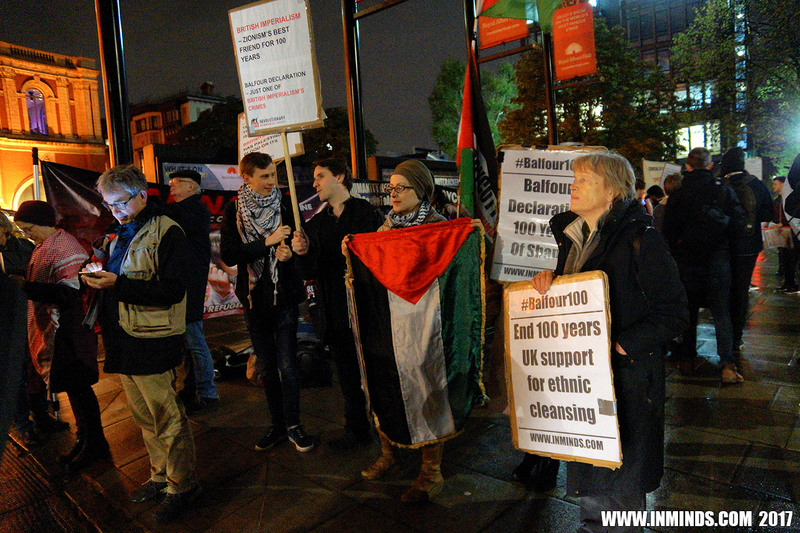 In Zionism he saw a way to rid the UK and Europe of its Jewish population by shipping them to Palestine. 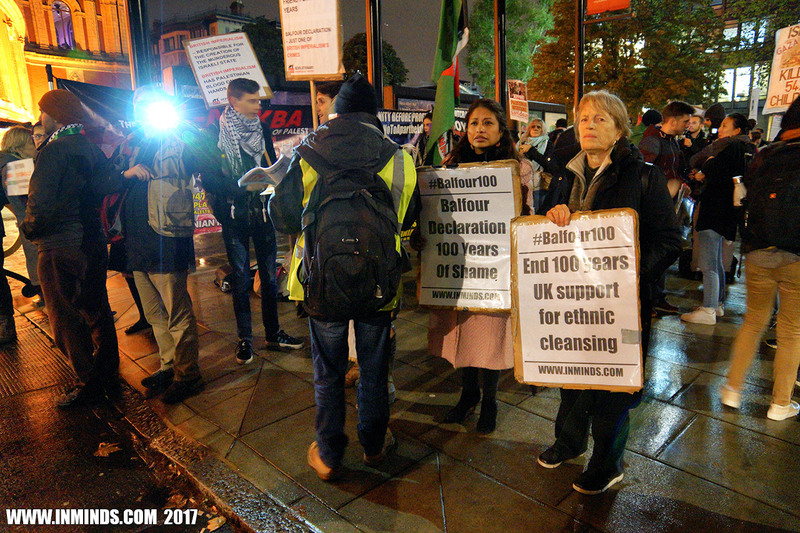 Earlier in 1905 he had passed legislation aimed at preventing Jews fleeing persecution in Tsarist Russia from entering Britain, calling them "undesirable". 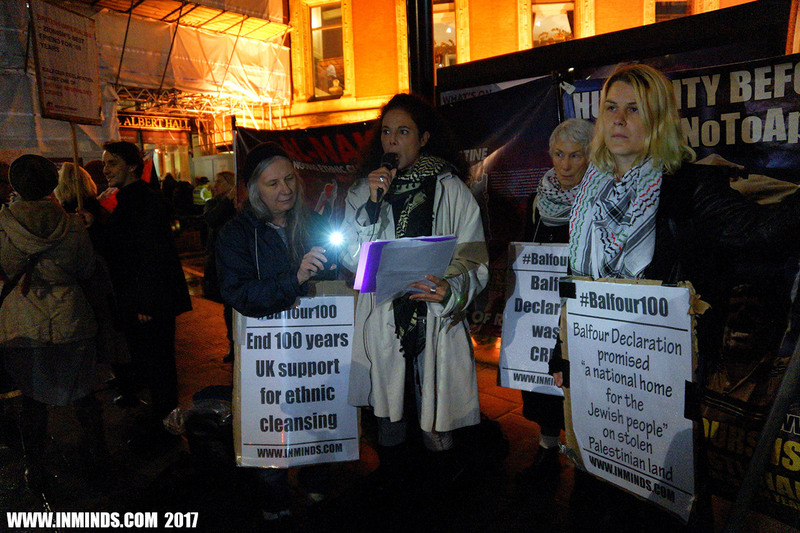 It is insightful, though not surprising, that the only Jew in the British Cabinet at the time of the Balfour Declaration, Edwin Montagu, opposed the declaration, whilst know racists and anti-semites in the cabinet all supported it. 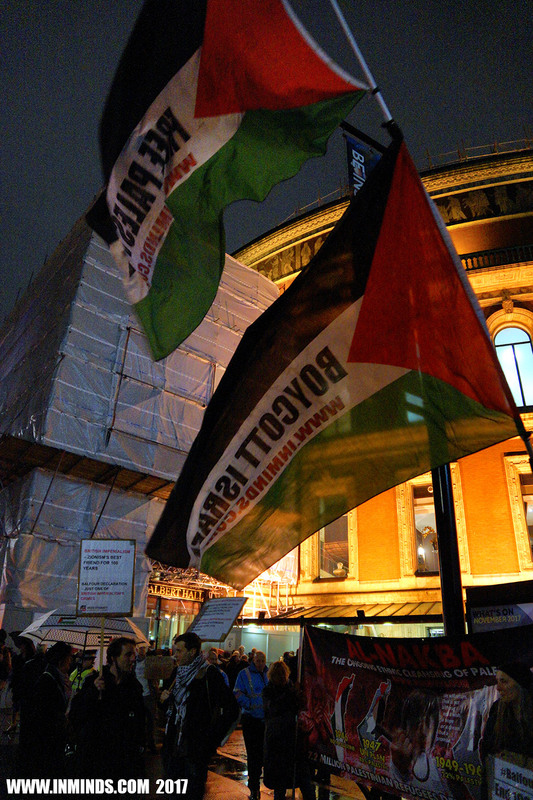 The policing of the event by the Metropolitan Police was very partisan, favouring the zionists. 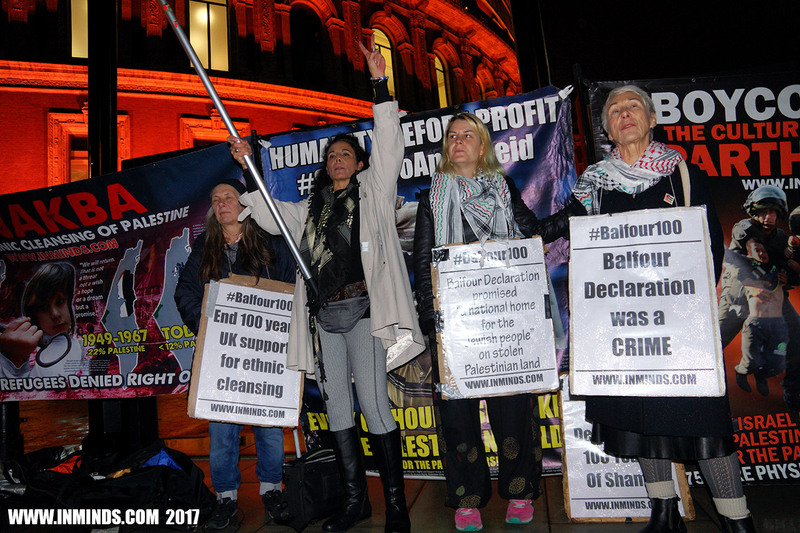 The police had blocked off all approaches to the Albert Hall and set up a pen for us across the other side of the busy A315, facing scaffolding - out of sight and out of sound of those entering the Albert Hall. 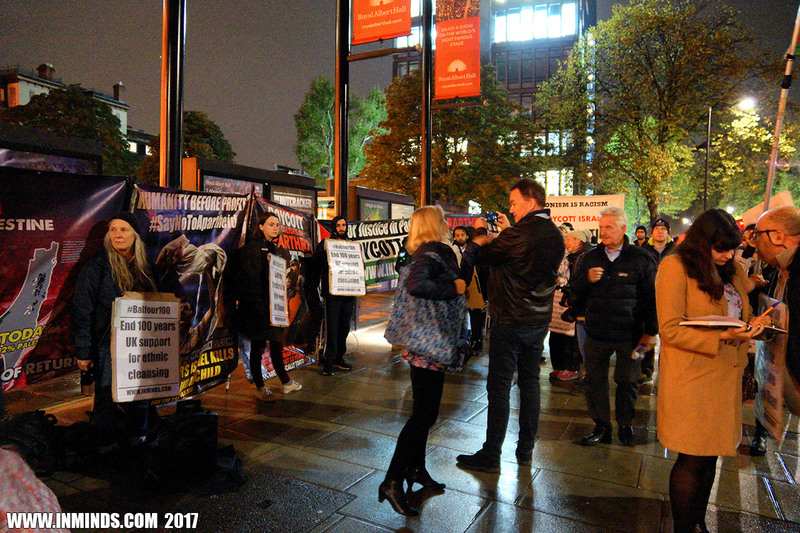 We refused to be caged in their pen and insisted on protesting on the public pavement adjacent to the main entrance of the Albert Hall as was our right. 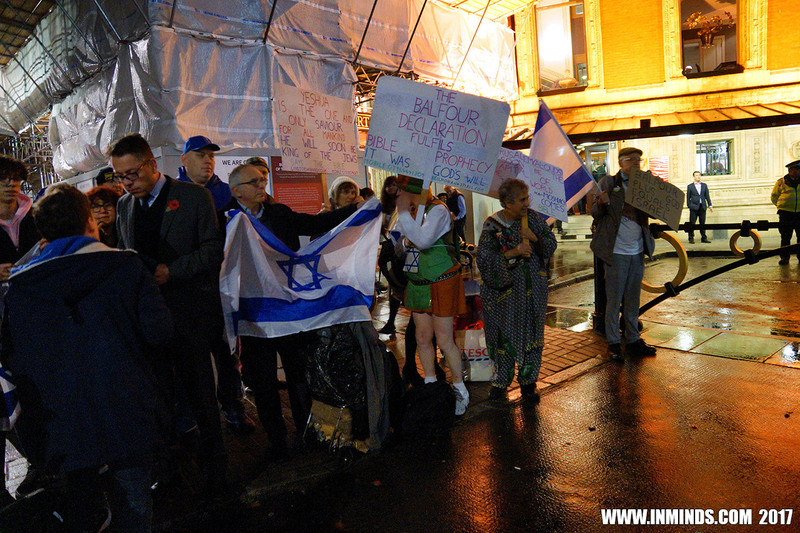 The police then pushed us back 5 metres away from the entrance insisting that the space was needed for people queueing to enter the hall, only later to allow zionists to set up their counter protest on exactly the same spot they had denied us with no objections being raised. 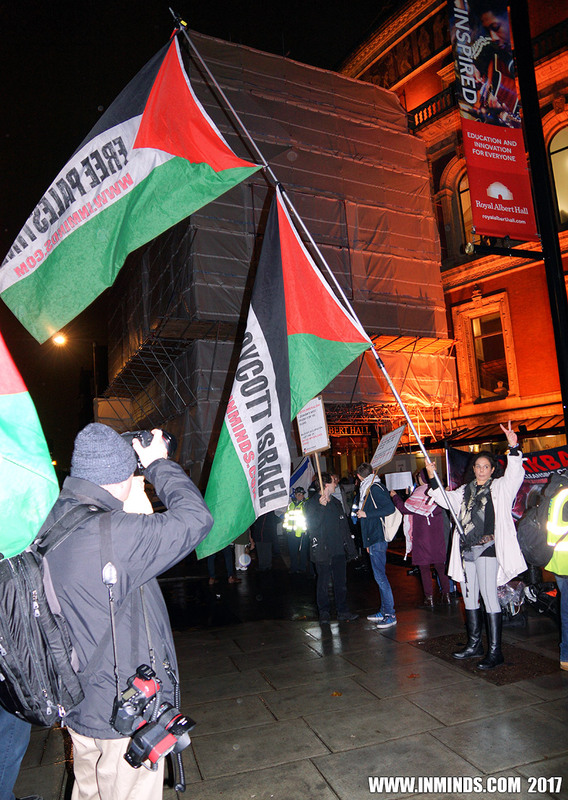 They made us move even further back claiming we were blocking an emergency entrance for ambulances whilst in reality the emergency entrance was around the corner clearly marked - do not obstruct with double yellow lines across it, the entrance we were at was blocked by ornamental gates with a single yellow line permitting cars to park across it in the evenings. 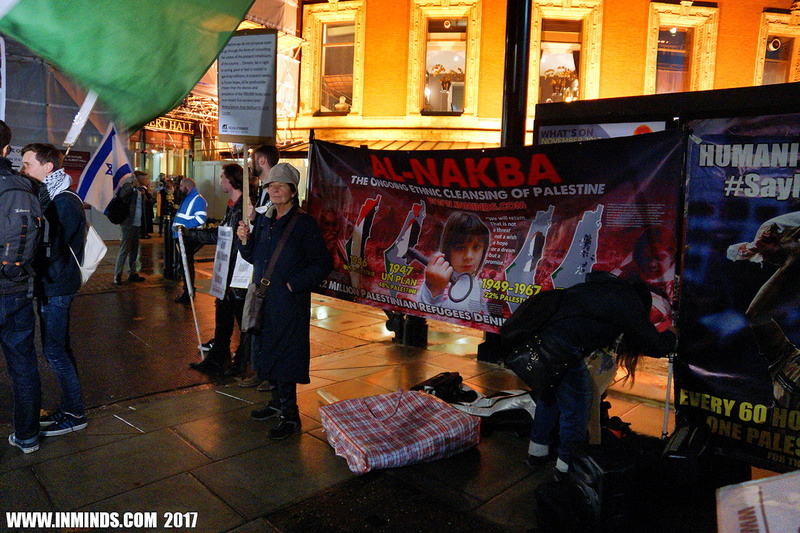 All along the police seemed to be taking their cue from the zionists, as we were setting up they asked to see what was written on our banners - we insisted they had to wait until they were up when everyone got to see them (and at which stage they could not easily confiscate any of them without causing an incident - at a previous protest they had unsuccessfully tried to confiscate the Mandela banner saying it was racist). 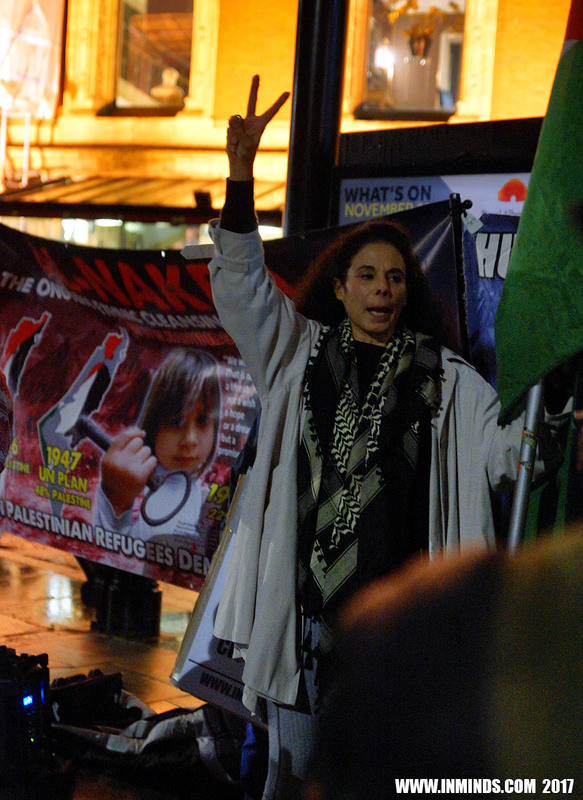 We assume they didn't find anything actionable this time as they didn't come back with any objections, but later when one of the other groups protesting with us waved the red flag of the PFLP, the police at the instigation of the zionists tried to confiscate the flag and make an arrest under anti-terror laws, claiming it was the flag of a proscribed terrorist group as this is what they had been told by the zionists. 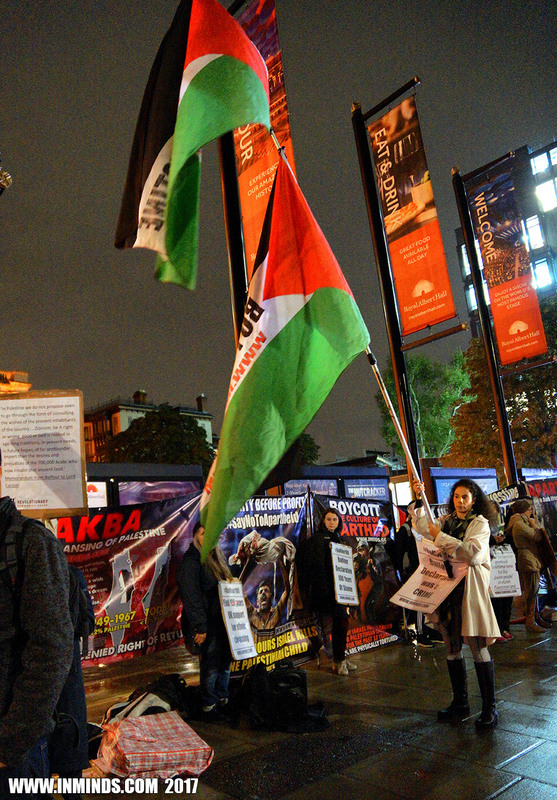 It was left for individuals to use google on their mobile phone to educate the police that the PFLP is not a proscribed organisation, before they backed down from making arrests and permitted the flag to fly. 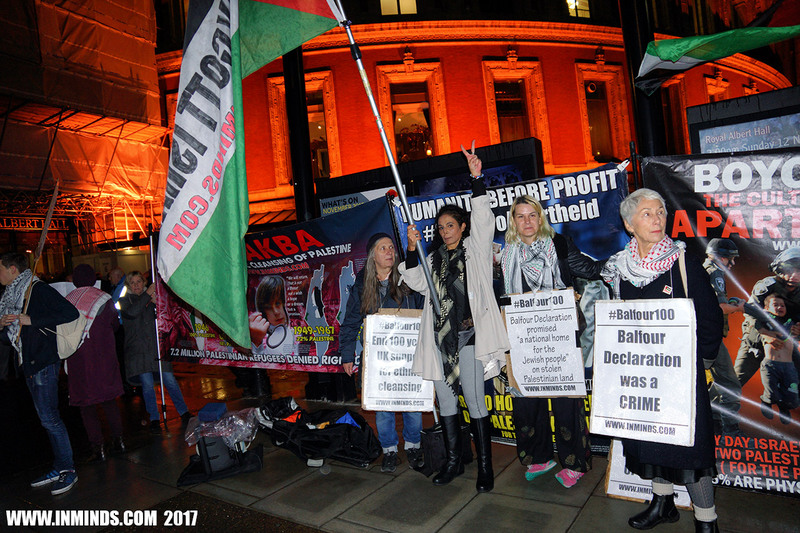 Inminds chair Abbas Ali said "The fact that the police didn't know the law and instead took their cue of what is legal in the UK from the zionists is shocking. 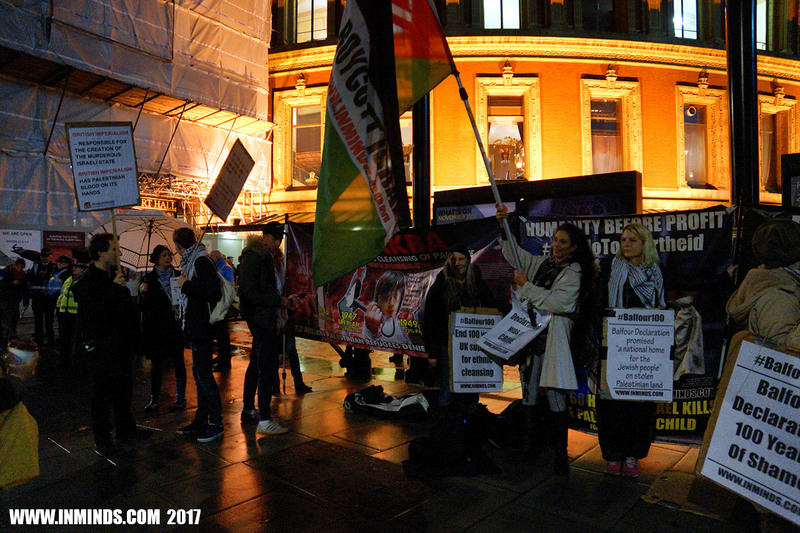 It is discrimination, and police misconduct which could easily have lead to a miscarriage of justice. 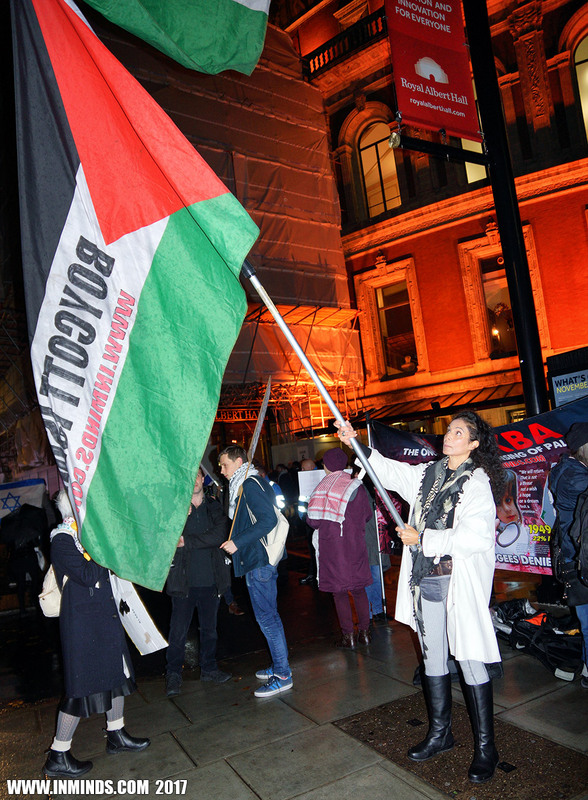 In the past this is exactly what has happened with people flying legally permitted Hizbullah flags being arrested by the police at the behest of zionists. 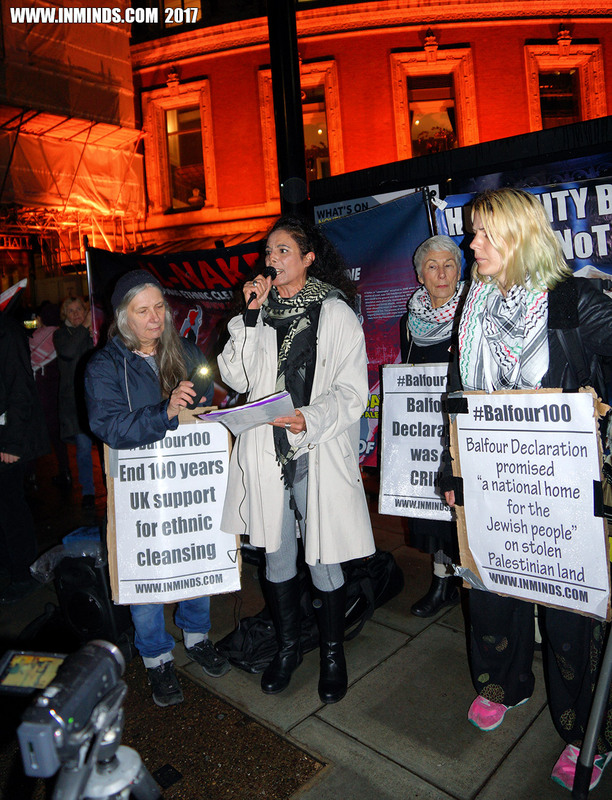 Whilst the police continue to act in such a partisan manner, with total disregard for the law, and instead follow the bidding of the zionist lobby, they will not win the trust of the community and will be seen as an instrument of the lobby."